Welcome back to the Winter Project Link Party! This is my third annual link party and I really hope you will want to join in with sharing your current works-in-progress (and your current projects as your finish them!) over the next several months. I'm so excited to be back to the link party. I always try to have a project going through the winter months, and I have found that our link party really helps me stay focused on my projects as the seasons progress. To join in with my party, please see the information at the bottom of this post. If you've joined in before, everything is about the same as in previous years. There is one new thing this year: I'd really like to make sure we're keeping our link party fresh by adding NEW posts. Please refrain from adding older posts from your blog. Otherwise, the party is simple and straightforward: show us what you're working on right now, get (and give) encouragement! 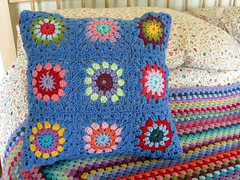 As for me, I'm now joining my Maybelle squares to make a big (erm, gigantic) blanket for our queen-sized bed. This blanket really is huge, but that's how we want it, for warmth on top of the duvet in the colder months. It should be about 90 by 90 inches square before adding a border, which at this point I am thinking will be pretty narrow. This blanket just won't need a lot of extra area by the time it's all joined together! I'm enjoying the joining process so much. It's really soothing and relaxing, and it goes by really fast. 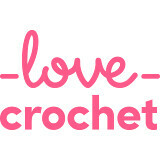 I have found that I need to sit in the deeper, wider living room chairs instead of the smaller recliner in the family room, where I sat to crochet individual squares for many months. The blanket is getting so big that I need the extra space around me to keep the blanket on my lap, or pushed to one side of my lap, as I work on it. I'm using the joining technique suggested in the Maybelle blanket tutorials written by Annette, of the blog My Rose Valley. 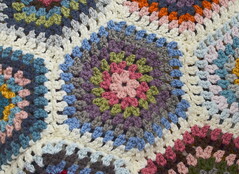 Annette's Maybelle blanket design is lovely, simple and very easy to follow. I really like the way the joins look. My blanket is a little lumpy (as it shall stay, since there is no way I could ever block such a humongous piece of crochet), but you can just see the pretty, lacy central join, where four corners meet. I'm sure that when the blanket is stretched and smoothed over the bed, the lacy look will show up better. For now, I'm just happy to have an easy, intuitive join method to watch develop as I work. This is all just so exciting to me! I was really beginning to despair about ever making this blanket when I remembered the Maybelle pattern. I love the flower design in this square, and I'm actually finding I like it even more with the additional round of gray in the joins. I think the colorful flower stands out even more nicely this way. I've made a lot of blankets, but watching this one actually become a drape-able, fold-able piece of fabric has been especially exciting. I think I'm working a little more feverishly right now than I have in a long time - I'm just so eager to use this blanket on the bed. With any luck, I will NOT be working on this project all winter long! It's link-up time! Please read the link-up guidelines below. To keep it fresh, please add your project posts about current works in progress or very recent finishes. You can add as many posts as you like. 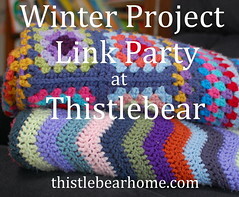 Be sure to link back to this post in your winter project post to help spread the word about this link party! it's so pretty and definitely looks warm. I've never make anything quite that big. It looks amazing, love the beautiful colours you have chosen against the grey. It will not only look stunning it will be really warm and cosy. You must be so happy with your blanket, it's looking fabulous and will be so cosy and snuggly once it's finished. That extra round of grey certainly does make the colours pop. Wow, that really will be a gigantic blanket! I love to have oversized bedding so appreciate the snuggle factor, it's a beauty. Look at how great your color idea is! Gray background is brilliant! This is one of my favorites of the blankets you've made. It really is beautiful! Can't wait to see it on the bed. I'm really enjoying seeing your blanket coming together now Jennifer. It looks very striking and elegant. The grey is a very good joining background colour to the soft delicate Maybelle flowers. Glad to see you are nearing the finish with your blanket. I might need to try this pattern out in the future. I'm lazy and usually stick with what I know, and what's easy. Why are you showing us the wrong side???? I would love a picture of the front. All of my photos depict the front of my work. Thanks for stopping by. It's so lovely. I especially love the peach shade you've chosen, it's beautiful with the dark grey. I bet you are excited to finish, you're on the home straight now! What a lovely blanket! Grey is the perfect foil for the soft blossom colours. I like that little secondary pattern formed by the motif joins. Is it Winter Link Party time already? (Where has this year gone?) I won't join in as my current projects are all kind of secret (book in progress!) but here's to many a completed work by winter's end. Hope you're all doing well, Jennifer. Have no idea how to join such a group. Would like to though. Have some unpicking to do on half an old project and would like to do the new version along with others! Lovely blanket. I made a Maybelle blanket earlier in the year (much smaller than yours as I was working to use up my stash) and it is a gorgeous pattern. I am looking forward to seeing your blanket grow.